Despite clouds rolling in and a late 2:00 PM start, I decided to make the snow-covered trek up Mount Storm King out of curiosity of the trail conditions and views, but most importantly, the challenge. The only footprints were my own - incredible experience to have the entire mountain to myself. Trail Conditions: Good snow for footing, however, warmer temperatures and melt could present issues for traction if it refreezes. 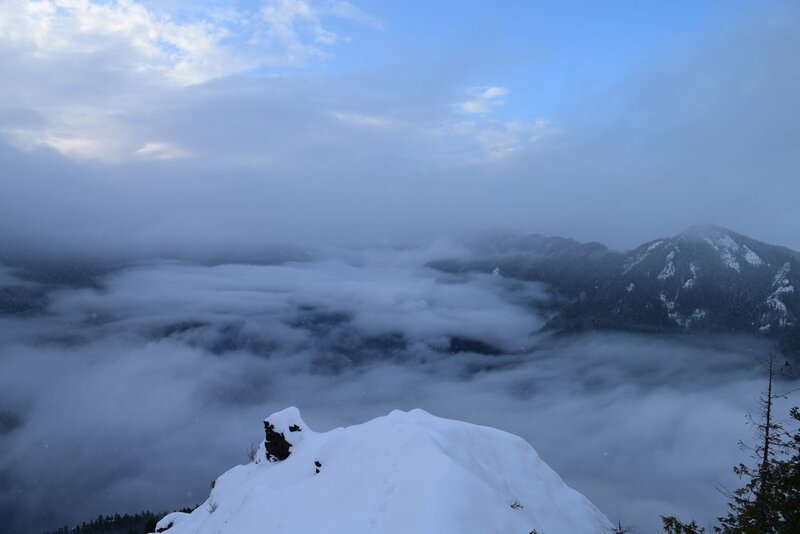 Disclaimer: hiking Mount Storm King is one of the more challenging hikes on the Olympic Peninsula even on a day with ideal conditions. It is very steep, has exposed cliffsides, requires the use of ropes to climb to the summit, and a narrow spine at the top to reach the viewpoint. I came very prepared with multiple layers, layers to change into (risk of sweat causing hypothermia), hiking sticks, micro-spikes for my boots, protein bars, and plenty of water.